Chipkin™ Modbus® RTU/TCP Data Client/Logger is a device that connects to Modbus® RTU slaves and Modbus® TCP servers as a Modbus RTU Master / Modbus TCP Client, and reads and stores the data. 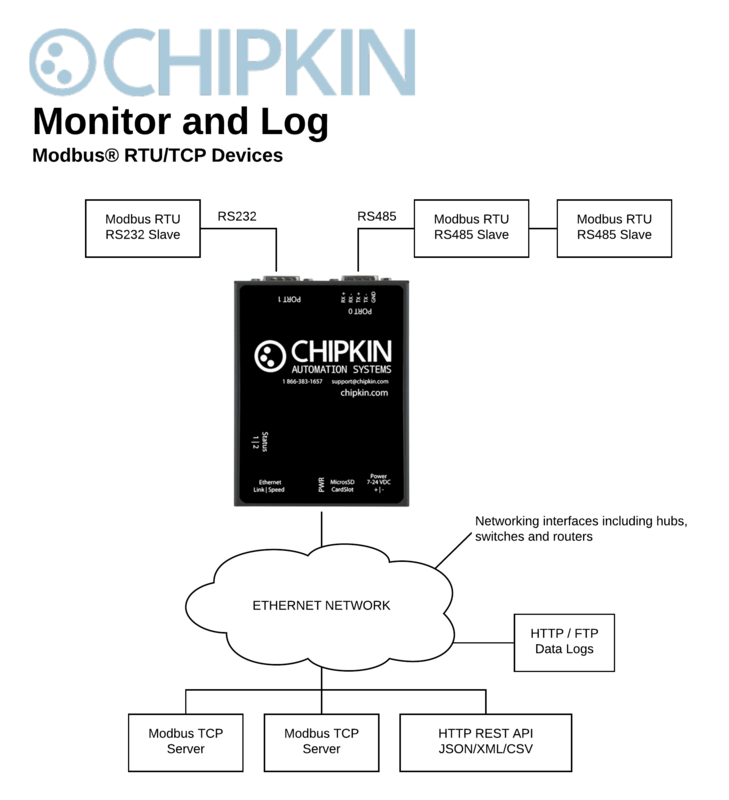 Chipkin™ Modbus® RTU/TCP Data Client (aka Data Logger, Data Recorder) is a device that connects to Modbus® RTU slaves and Modbus® TCP servers as a Modbus RTU Master / Modbus TCP Client, and reads and stores the data. The data client operates by reading data from the configured registers and stores the values in an internal database. These values can then be logged to an archive file or can be accessed via the data clients REST API as XML, JSON, or CSV data using HTTP Get requests. Log files can be accessed by a Web Browser or FTP client. The device requires minimal configuration and can be considered a ‘plug and play’ component of any network system. It’s ready to operate ‘out of the box’ and can be installed without an engineer’s approval. The CAS 700 Hardware device contains 2 9-pin serial ports (1x RS485 and 1xRS232), and one Ethernet port. The device also contains a microSD card where system files, assets, configurations, and logs are stored. HTTP Push Driver - a driver that can be configured to push data in a specific format (JSON, XML, CSV) to a 3rd party web server. Current data formats are Chipkin's default JSON payload and VeederRoot Tank data as JSON. Please contact Chipkin for information on adding additional formats. The following specifications are common to all Chipkin gateways.